I got my wife a puppy for Christmas. She’d never had one, and I hadn’t since high school, so neither of us was entirely prepared for everything this entailed: waking up early to take it for walks, filling little plastic bags with feces, waking up early to feed it, mopping up puddles of urine, and worst of all, waking up early. Like anyone facing a sudden, dramatic change in life, I was sent reeling back to first principles—and in Los Angeles, where we learn Aurelius from Hannibal Lecter, the first principle is always the same: How will this make me famous? It didn’t take me long to reach a conclusion. I’m not the kind of person who seeks out dog movies. But the first film I ever saw was about dogs, and I admit they can add something irreplaceable to a film, whether they’re robbing banks, enabling bickering alcoholics, or simply failing to talk someone out of suicide. I had a vague sense that in other fields—sheepherding, alpine rescue, Soviet rocketry—people might frown on me for using a dog to seek fame by proxy. But in the entertainment industry, it’s a hallowed tradition: For years, the highest honor an animal actor could earn was an award called the PATSY. The way forward was obvious: I would cast our adorable puppy into the moral tarpit of show business. Worst-case scenario, I figured Susan Orlean might write a book about me. Not every dog can be a star, but in all candor, I thought ours was a sure thing. She’s a 5-month-old Boston Terrier, and by general neighborhood acclaim, adorable. Because she had what we perhaps mistakenly anthropomorphized as a wry disposition (and because we’d been re-watching the Bond movies), my wife named her Moneypenny, which she usually responds to. She quickly learned several tricks: “sit,” “down,” and “roll over,” although due to a sensible distaste for cold floors, she’ll only perform them on carpeting. But that seemed like a relatively minor demand from a star. I would describe her as mostly housebroken, which—if Peter Biskind is to be believed—put her ahead of Faye Dunaway. Above all, she had youth and beauty, and youth and beauty trump bad behavior every time. All the beauty in the world wouldn’t matter if Moneypenny didn’t want it badly enough, but there were certain encouraging signs. Her favorite place in the world was the dog park right under the Hollywood sign. What’s more, she showed a keen appreciation of the formal qualities of filmmaking, particularly sound mixing and foley editing. (To be precise, she has an intense interest in films where the sound of someone knocking on a door is mixed to the right rear surround, near our own front door.) Best of all, her favorite movies, the ones she watched raptly again and again, all featured the sound of dogs barking, snarling, or even howling. In other words, exactly the sort of film most likely to cast a dog. Given such a passion for the silver screen, it seemed to me that it would have been cruel of me not to try to profit from it. I knew, however, that I wasn’t prepared to manage the career or vast fortunes of a beloved world-famous dog. To thrive in Hollywood, Moneypenny would need a Svengali, a Colonel Tom, maybe even a Lou Pearlman. Waiting to be discovered wasn’t an option: Schwab’s closed years ago, and even in its heyday, it didn’t serve animals. But Moneypenny and I had an edge Lana Turner never dreamed of: the Internet. It didn’t take a lot of Googling to find exactly what I was looking for. The first result for “How do I train my dog to get rich in Hollywood” led me to the Hollywood Paws.com Animal Career Academy™ and Pet Agency. They seemed to have the right attitude: Beneath an artist’s rendition of happy animals frolicking around the Hollywood sign, the webpage promised to help me and my dog “START A CAREER IN THE 54 BILLION DOLLAR PET INDUSTRY.” If Moneypenny earned even half of $54 billion, I’d never have to work again. I admit there were warning signs: The homepage linked to a nonexistent Twitter page that spelled it “H0llyw00d Paws,” like it was trying to bypass a spam filter. And despite the name, Hollywood Paws isn’t exactly in Hollywood—it’s at the Los Angeles Center Studios in Westlake, in the retrofitted shell of the Union Oil Center. But for a business that set up shop in a renovated oil-company building, the studio had an impeccable architectural pedigree and its own storied history as a filming location. So I filled out the contact form—which promised a chance at a free trip to L.A. and pet photo shoot, and, worst-case scenario, a guaranteed free brochure—and requested an interview. Days passed, and I received no response. Show business requires persistence, so I tried email. Still nothing. Finally, I called the toll-free number, where a cheerful operator took my name, my address, and my dog’s name, age, and breed, and promised a callback. I didn’t mention the possibility of an interview to the operator, but they must have put it together, because once again, no one contacted me. Moneypenny’s first attempt at wealth and fame didn’t even rate the free brochure. I suppose I should have guessed something was awry when I told the operator we lived in Atwater Village and was asked if I’d be willing to travel to Los Angeles for film appearances. The section of the website promising a $10,000 scholarship raised further red flags—surely tuition could be covered by part of my dog’s earnings. A little more research shed some light on why the proprietors of the Hollywood Paws.com Animal Career Academy™ and Pet Agency might not have been thrilled to talk to the media. In 2006, they were the subject of a class-action lawsuit from unhappy clients, who paid thousands of dollars for training classes in hopes of fame and fortune that the agency failed to deliver. (Hollywood Paws won the lawsuit in 2009.) Its Yelp reviews didn’t inspire much confidence either: “They are the biggest scam in town,” “BE CAREFUL! !” “Do Not I repeat Do Not give them any money period!” and perhaps most ominously of all, “Now I know how Mia Farrell was feeling in Rosemary’s Baby.” Still, although the last review didn’t have anything good to say about Hollywood Paws, it ended on an inspirational note: “I will not give up on Julez or myself, she will be America’s most loved dog.” That was just what I wanted for Moneypenny, even if it meant crushing Julez’s dreams along the way. Clearly, I needed a different agent. 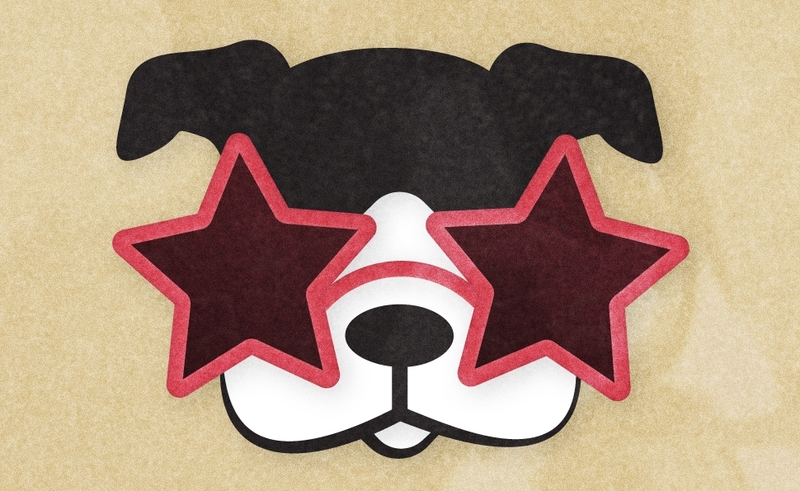 A little more Googling led me to Le PAWS: A Hollywood Pet Agency For Dogs. Its website was tasteful and professional, and even the name promised a certain Continental flair that might offset Moneypenny’s all-American heritage. As far as I could tell, its reputation was sterling: on MTV’s Rob & Big, Rob Dyrdek referred to it as “the William Morris of dogs.” Even better than appearing on other people’s reality-TV shows, Le PAWS had its own, Off The Leash, on Lifetime. And even though its website conspicuously failed to promise my share of untold billions, it seemed to have the appropriate commitment to luxury. An online clip from Off The Leash showed one of Le PAWS’ clients being fed treats immaculately plated on a cake stand, while an agent made sure a hapless PA provided filtered water only. Most importantly of all, Le PAWS answered my email. I spoke over the phone to Michelle Zahn, the agency’s co-founder, to try to get a sense of Moneypenny’s prospects. Zahn founded the agency in 2005 after trying and failing to get her cat—who weighed 32 pounds—into show business. Discovering that animal casting was almost entirely controlled by a cartel of ranches outside of Los Angeles, where productions could rent not only dogs, but lions, tigers, or cockatoos, she started her own business to allow private pet owners a way in. At first she haunted dog parks, looking for potential stars. Personality and trainability matter, she told me, but not as much as appearance. For commercials, the ideal is “what middle America considers an all-American dog”—which means a lot of work for golden retrievers, Labradors, and the like. Larger dogs are almost never cast, and when they are, it’s usually for scenes involving a lot of threatening barking. Even when directors know what kind of dog they want, Zahn has to figure out exactly what the job requires. Sometimes this is a matter of asking the right questions: When the director says, “The dog just has to walk down the street,” does he or she really mean “The dog just has to walk down the street while a sports car skids around the corner and misses it by inches?” Often problems don’t become apparent until the camera is ready to roll. A dog who can sit next to a child actor, as described in the casting call, is not necessarily a dog who can sit next to a child actor at the edge of a cliff and watch the sun set over the ocean, with no trainers or anything else in his line of sight to draw his attention. Finding a solution on the fly (boom pole, hot dog) can make the difference between a successful shoot and a wasted day. After my Hollywood Paws experience, it was refreshing to talk to someone who clearly knew her way around a set. With success, however, comes demand, and it quickly became clear that although Moneypenny might need Michelle Zahn, Michelle Zahn didn’t need Moneypenny. She doesn’t even tell people what she does for a living anymore, to avoid the inevitable cellphone pictures of dogs that will never be famous. With 200 clients, 40 or 50 working regularly, it seemed unlikely she’d be interested in adding a badly behaved Boston terrier to her roster. Worse still, she explained to me that she encourages her clients not to quit their day jobs. The average day’s work for a dog pays $300, after the agency takes its fee (30 percent, vs. 10 percent for human actors). At that rate, to earn $54 billion, my dog would have to work every day for nearly 500,000 years—3.5 million dog years. The downside to speaking with a legitimate pet agent was the lack of false hope. By the end of our conversation, I was so disheartened, I didn’t even ask about Moneypenny. But maybe I’d been thinking too small. Maybe the answer was to leapfrog past the commercials, reality TV, and print work and go straight to the top. When it comes to human actors, people can argue for hours about the various merits of your Blanchetts and McConaugheys, but for dogs right now, there is only Uggie. You know Uggie, even if you don’t know his name: He’s the Jack Russell terrier who starred in Water For Elephants, before really breaking out in The Artist. That performance earned him the Palm Dog at Cannes, the Golden Collar Award, and a paw print ceremony at the Chinese Theatre—the only dog to ever have one. Uggie flies first class. Uggie doesn’t just attend the Oscars, he gets thanked in acceptance speeches. Uggie writes celebrity memoirs. Uggie feuds with Martin Scorsese. This was the career Moneypenny deserved, not dog-food commercials and calendars. I tracked down Uggie’s trainer, Omar von Muller, to see what my next steps should be. I met von Muller at Link-n-Hops at the foot of the Glendale-Hyperion Bridge, in the heart of Walt Disney’s old stomping grounds. The restaurant smells of grilled sausages and is dog-friendly enough that the waitress brings a water bowl to the table without asking—more or less the canine equivalent of the Ivy. Uggie, already old when cast in The Artist, has retreated into Garbo-like seclusion, but von Muller brought along his latest protégé, a border collie named Jumpy. I mean no disrespect to Uggie when I say Jumpy makes him look like a piker. One video shows Jumpy riding a skateboard off a ramp and around a skatepark, slaloming around traffic cones on his front paws, careening down a bike path standing upright on a three-wheel kick scooter, wakeboarding, and performing a standing backflip. Another focuses on parkour. For all his apparent energy, Jumpy sat quietly at von Muller’s feet while we ate lunch. Moneypenny, either nervous in the face of celebrity or hungry for sausages, kept jumping up on our legs. Despite this, the meal was an object lesson in Hollywood’s persistent ageism: Over the course of the meal, several people ignored Jumpy, possibly the best trained dog in America, to pet a puppy that kept tripping over her own leash. I asked von Muller up front what he looked for in a star. “What I want is a dog that is healthy, that has a good attitude—you’ve gotta have the looks.” On these grounds, at least, Moneypenny stacked up, but not for the reasons I’d thought. “She’s really good because she has a lot of white in her face,” von Muller told me. It turns out that dogs with dark fur are difficult to light, and DPs won’t relight a scene with human actors to accommodate a dog when they can just recast it. But light fur isn’t enough on its own. Although von Muller said Moneypenny might find work in print—at least while she’s still a puppy, in roles where a model held her, removing her behavior from the equation—he wasn’t hopeful for much more. His final assessment: “She’s very cute, she’s a Boston terrier, can be trained, and so on—but realistically, is she going to be in the movies? It’s a very slim chance.” On the way back to our cars, von Muller took Moneypenny’s leash and gave it to Jumpy, who patiently held her still for a picture while she squirmed and tried to pull free. I came to lunch prepared to face the fact that von Muller would do a better job training my dog than I had. Now I realized that von Muller’s dog was a better dog trainer than I was. As that sank in, von Muller made Jumpy do a backflip. This was the closest thing I’d gotten to encouragement since I’d gotten the puppy, so my wife and I attended a Zoom Room orientation. You don’t bring your dog to orientation, which played to Moneypenny’s strengths—as far as anyone would know, she was as talented as Jumpy. We went to the Hollywood Zoom Room branch, a building which has already secured its place in film history as the original location of Rocket Video. The interior was spotless—cleaner than it had been when it was full of DVDs and VHS tapes. There were ramps, tunnels, and what looked like a seesaw. Skateboards of various sizes hung neatly on the wall, next to the spray bottle, paper towels, and plastic-bag dispenser that explained the lack of odor. After browsing the dog toys and treats, we were given a complimentary clicker and led with seven or eight other dog owners to a row of plastic stools on the exercise floor. A trainer named Chris, who spoke with the same flat vowel sounds as Owen Wilson, walked us through everything we’d need to know to enroll in classes. None of it seemed to have anything to do with forcing my dog to enter show business. I sat anxiously through the talk of prerequisites, course plans, clickers, and dog-pee etiquette, biding my time like Pee-wee touring the Alamo. Finally Chris opened the floor to questions. One woman asked if her dog walker could attend the classes in her stead (yes); another asked if it was true, as the website said, that her chihuahua could be trained to herd (yes, but not sheep). At long last, I asked when they would next offer classes in set work. “We have a class in scent work coming up soon, actually,” Chris told me. Although teaching Moneypenny to find my lost cell phone did sound useful, it wasn’t what I was looking for. I didn’t want to waste the other students’ time, or give them any ideas about making their dogs into movie stars but after the Q&A was over, I sought clarification. No film classes were currently on the schedule. Well, you don’t have to be rich or famous to enjoy Los Angeles. And if Hollywood didn’t want Moneypenny, maybe Moneypenny didn’t want Hollywood either. In a fit of pique, we drove home, picked up our dog, and put the Hollywood sign in the rearview mirror. South of downtown, the film industry vanishes completely. The 5 to the 605 to the 405. The names of the exits get lusher as the view from the highway gets weirder and more industrial. Lakewood, Rosemead, Hawaiian Gardens: Atlas Survival Shelters, the Commerce Casino, a tire factory—now an outlet mall—modeled after the palace of Sargon II. These aren’t even filming locations. We got off the interstate at Seal Beach, finding neither seal nor beach, but Leisure World and the Naval Weapons Station. Turning onto Pacific Coast Highway, I dropped the top and put on surf music, but it was cloudy and cold and just made things worse. But as we went further south, PCH started looking like itself again: motels and biker bars and the smell of fried seafood. We crossed the county line and arrived at the Huntington Dog Beach, right across the highway from a row of ceaselessly bobbing pumpjacks. You couldn’t be further from Malibu—up the coast is a clear view of the refineries of Long Beach, and across the water are Huntington Beach’s two remaining oil platforms. But dogs are allowed off-leash here, and for all her time in Hollywood, Moneypenny had never seen the ocean. From what we could tell, she’d never imagined such things were possible. Our unfamous dog sprinted up and down the wrack line until the tide swallowed the sand and the lights on the oil rigs came on.